Number 4 Will Blow You Away. Your entryway is the first thing people see when they walk into your home, and you know what they say about first impressions. Since you’ve only got one shot at wowing them when they walk in, it’s important to get every detail right. When it comes to floors, foyers and entryways need extra consideration. This is where even the most fastidious family and friends will track in grit, grime, and mud from outside, so foyer floors need to be durable. You’re looking for something tough but beautiful that will last for years without succumbing to scratches or dings. Pro Tip: Create a spot for shoe storage in your foyer so that everyone can take off their shoes to protect the floors. Your entryway floors will still need to be tough, but this will go a long way towards protecting the flooring in the rest of your house. Next on the wish list? Floors that are easy to clean. This is not the place for a dry-clean only heirloom rug or a porous surface that will absorb and trap stains. Foyer floors should be easy to sweep, and ideally, they’ll be water resistant. Arizona definitely isn’t the wettest spot on Earth, but you’ll want to be able to wash down the floors without worrying about damaging them. Finally, you’ll want something that looks amazing. Fortunately, you’ve got options that are both durable and gorgeous. So what’s hot in home decor for entryway floors? Check out our favorite trends for the new year, all of which are strong enough to handle your toughest foyer traffic. Anyone can install square tiles or basic floorboards, but why be tied down by traditional, rectilinear design when you can choose a curvaceous look instead? Even a small entryway can be a stunner when you add a floor that radiates out from a central point in a sunburst pattern. This pattern can be accomplished with specially cut marble, tile or stone, all of which are great choices for a durable entryway. Even minimalists will enjoy a two-toned floor that clearly delineates the borders of the entry hall. While most of this floor is simple in clean white, there’s a basic black border around the edge, which blends into the black baseboard for a clean, cohesive look. This looks just as great in natural stone as it does in inexpensive ceramic tile, which is even easier to wipe clean as needed. Pantone’s “Night Watch” is one of the hottest paint colors for 2019. It’s a deep forest green that evokes nature and its soothing effects, so it’s perfect for blending indoors and out at the point where they meet in your home. 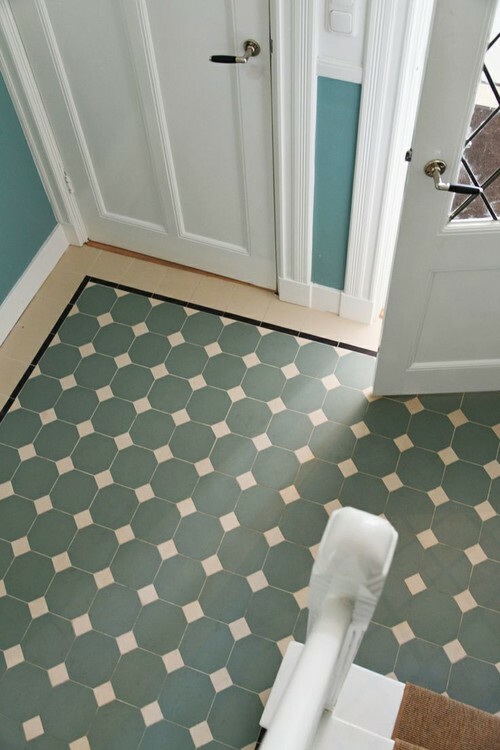 Get colorful underfoot with a classic octagon and diamond pattern, but make the big tile green and the little one neutral for a totally modern take. 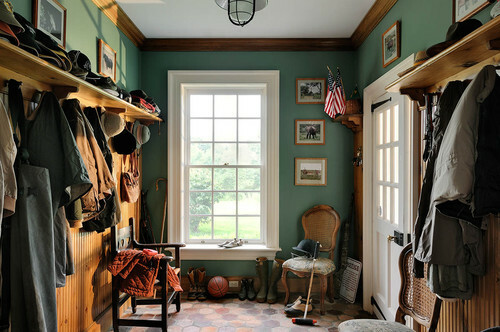 If green floors aren’t your thing, paint your walls a rich hunter green and go neutral on your floors instead. Choosing tile in a range of shades from tan to deep honey brown will add interest. For a truly unique look, select medium hexagonal tiles instead of square ones to create a rhythmic pattern and echo some of nature’s cleverest architects. Wood is a classic flooring material and can make a stunning impression in a foyer, but it can be marred by grit and succumb to stains over time, especially if the finish wears down under the assault of heavy foot traffic. Fortunately, you can still get the look with floor tiles designed to look like wood. These have skyrocketed in popularity and will still be going strong in 2019 thanks to their supreme durability. Perhaps the biggest decorating trend of all is making your home a unique expression of your personality. To that end, consider the power of tiny hexagonal tiles that can be arranged in an endless number of patterns. It only takes two colors — though you could add more! – and a bit of imagination to arrange the tiles in a fancy border or create one-of-a-kind patterns in your entryway. Make 2019 a year to remember when it comes to your home decor by choosing durable, delightful flooring to renovate your foyer or front hall. It’s a remarkably quick way to upgrade the entire look of your home – and a project that guests are sure to notice the moment they step across your threshold. This entry was posted in Carpet Flooring, Flooring, Laminate Flooring, Tile Flooring and tagged 2019 Flooring Trends, Best Foyer Floors on January 17, 2019 by Express Flooring.